In weekly Music Lessons taught by our music instructor, children learn “sounds” needed in early childhood and come to know that “music is fun”. Junior children mainly enjoy rhythm using percussion, Intermediate and Senior children get familiar with keyboard. 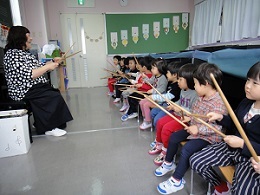 Junior music lessons centre on percussion instruments. 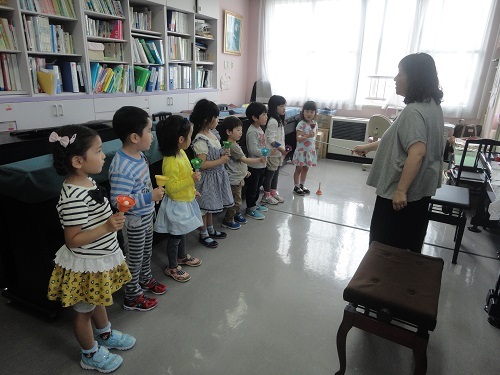 The children enjoy tambourines, hand bells, castanets and more as they learn to make musical rhythms. Children also sing seasonal songs and nursery rhymes. 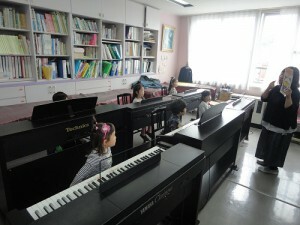 Intermediate children are split into groups to take piano lessons. They learn to recognise “Do, Re, Mi” while reading from sheet music. They practice on the piano with their right hand. 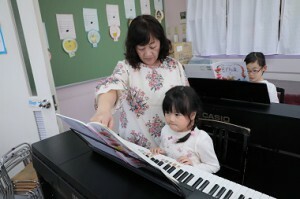 Senior children improve their musical ability and are challenged to play the piano with both hands. They are also given the opportunity to play a wider variety of instruments as well as taking part in concerts and choruses. Immersion class students sing a lot of english songs in class. The intermediate classes practice the handbells in class and seniors practice the melodeon.